If you have drains that are slow, smelly, or gurgling, or you have slow-flushing toilets, it is likely time to have a qualified plumber, like Steve's Service, come out and inspect your plumbing system. Many times, we find that snaking or hydro jetting is enough to fix the issue; but, if the issue remains, then further investigation is needed. At Steve's Service, we use a specialized sewer inspection camera to determine the exact cause and extent of your drain or sewer line issue. By visually evaluating your drain and sewer lines, we can determine if the problem is limited to just a portion of your line or involves the entire line. Depending upon the extent of the damage and the age of the pipes, we will either recommend pipe rehabilitation or complete pipe replacement. 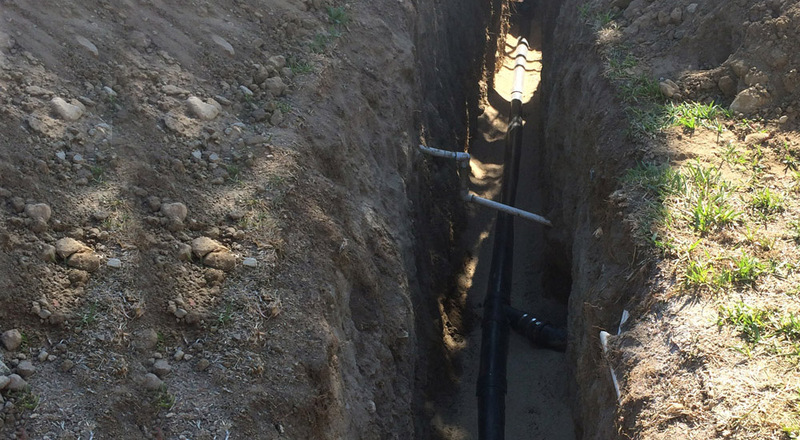 Drain/sewer line repair and replacement usually involves hand digging or using a tractor to excavate the area directly over the pipe with a tractor; however, with Steve's Service, there is the possibility of having your pipes repaired or replaced without entirely digging up your yard. Unlike many other plumbers, Steve's Service specializes in trenchless pipe bursting and rehabilitation/relining. These "no-dig" methods of replacing and repairing pipes are not only less invasive, which can save your floors, driveway, or landscape, but also less expensive than traditional sewer line replacement and repair. Our trenchless pipe repair and replacement services are often completed in less than a day. For those whose sewer lines have been clogged or intruded by tree roots, we also offer hydro jet cleaning and RootX treatment. Hydro jetting effectively cuts out the majority of the roots in the pipe, while RootX kills any remaining tree roots and helps to prevent them from coming back. While drain cleaning and RootX are less expensive than sewer line repair or replacement, they are considered a temporary solution because the roots will continue to seek out the sewage/water that is already seeping out of a break in the pipe. Still, this can be a great option for property owners who either are in the middle of selling a property or can't afford pipe repair/replacement. Because all drains connect to the main sewer line, having a well-maintained sewer line is critical. To prolong the life of your sewer and drain lines, it is important to schedule preventative maintenance visits. Our drain and sewer line scheduled maintenance is primarily dedicated to checking and cleaning/hydro jetting your interior and exterior plumbing, so that you can proactively avoid common problems, such as slow drains and backups, and fix minor issues before they become major ones. Our scheduled maintenance service is customizable; we can adjust the frequency of our visits based upon your level of usage or your allowable budget. Call Steve's Service today and let us know if you're interested in preventative maintenance, a camera inspection, or repair and replacement services for your sewer line. We serve all of San Bernardino County and provide 24-hour service for emergencies. Steve's Service is fully licensed and insured. This is a letter commending your employee Tyler. he came to our residence on three separate occasions, and I was extremely impressed by his expertise, professionalism, and friendly demeanor. i would not hesitate to call him back if I ever needed more plumbing work in the future.